Jolies reproductions. Bon anniversaire, Astrid ! At least I hope you do today... Have a wonderful birthday, Astrid!! I LOVE IT! HAHAHAHA! You fit this to a "T", of course. And I love where you put your signature. Lovely image Astrid! Happy Birtday to you! Have a great day. Happy birthday to you! Have a lovely day there in your mad Hollandish world Astrid! Haha- what for a wonderful cadeautje to your birthday! Happy birthday to you, lieve Astrid! So I thought, Astrid - just right for the Dutch Birthday Girl!! First of all HAPPY BIRTHDAY ASTRID HAPPY BIRTHDAY ASTRRID HAPPY BIRTHDAY ASTRID. My internet is being silly and continually dropping out, but never mind because help is at hand. A new fibre optic super fast network has been laid to my door and connection is due on 21st September, the day after we get home from continental Europe. What I am leading to is that my PC will not show me the video you posted. but I can imagine which famous song it is - Two lips from hampster jam. Have a great day, or if you are at work, great evening. But have a happy day nonetheless. I had a great day at work Wednesday, and I brought something for 'with the koffie'... always appreciated by the colleagues. Ha ha ha Of course that is what you do. Don't forget about eating chocolate and salty licorice. Here we eat lobster and potatoes all day and go to the beach. Happy Birthday, Astrid. Hope your day is perfect and your year a great one! Van harte gefeliciteerd, Astrid. 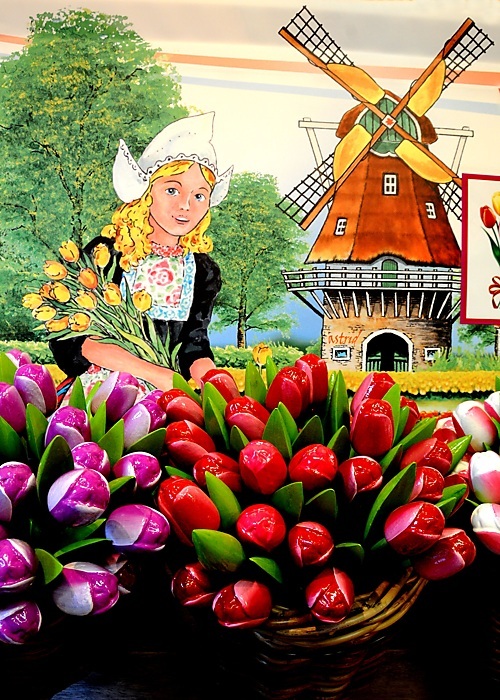 That (typical) blond haired girl in the tulip field, must have been you, a few years ago. Put on your clogs then and give us a Birthday dance. A wonderful picture form the birthday girl, have a very happy birthday Astrid. You Dutch folks even all look alike, Astrid!! !